2018 saw the introduction of our newest activity – Walking. Unfortunately, due to such a wet start to the year, we weren’t able to actually start walking until July which was most unusual for the Gers! We aim to meet up, walk and talk at least once a month and sometimes with a picnic afterwards. Everyone is welcome including partners and dogs. We also try to re-walk the previous month’s walk for those that were unable to make the original date. For our first walk, we set off on Friday 13th July for Ju Belloc. This was an easy circular walk (about 8 kms) and took no more than 2.5 hours to complete. 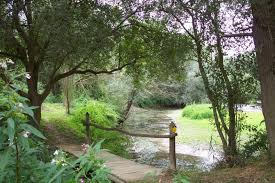 The walk started at the ‘Maison de l’Eau’ in Ju Belloc and continued through a pretty Nature Reserve that used to be a donkey sanctuary. We were disappointed to see that the donkeys were no longer there but we did see some on our walk in the fields! The Reserve is very well organised with good footpaths/tracks to follow. We then skirted along the River Adour and lake following the Greenwich Meridian Line and turned off towards Belloc. We then travelled back northwards parallel to the D173 on footpaths towards our starting point. We passed by some pretty flora and fauna as we walked through ancient woodlands and saw the ancient ‘lavoir’ and mill near Ju Belloc. For our second LLC walk on Friday 10th August, we walked an easy (7kms) circular walk around Sabazan near Aignan. Sabazan is a pretty little village with its half moat which dominates the valley of the Midour. On our walk, we saw excellent views of the valley and the Pyrenees. We passed by the lovely old 15th century church of St John the Baptist (some of the inside is classified 13th century) and also some of the vineyards of St Mont. Wine tasting is available at the Chateau and winery. We also passed close by to the Palmeraie de Sarthou. We were a small group and the weather was excellent for walking – not too hot nor cold. We greatly enjoyed our walk with fantastic views and good company. For our third walk which took place on Friday 7th September, we walked a slightly more challenging easy circular walk of 10 kms from Blaziert. Blaziert is a very pretty hill-top village located between Condom and Lectoure and has a ‘4 Fleuri’ rating. It is also on the meridian line and has a unique ‘cadran solaire’ with its very large sundial. We passed through ancient woodlands, lakes, vineyards and beneath the Chateau de Mons with its fine history. A very picturesque and varied walk. The fourth LLC walk took place on Friday 5th October and started at the ancient and interesting Flaran Abbey near Valence-sur-Baise. It was slightly longer at nearly 12 kms but a moderately easy circular walk. We followed tracks through ancient woodlands and visited the well-kept ancient Graziac lock on the River Baise. We then continued onto the small village of Herret (village fleuri) with its aerodrome. Along the ridge there are fabulous views of the Gers countryside. We then continued to head back towards Valence and the Abbaye de Flaran passing through the hamlet of Canonge with far reaching views of Valence, the Abbey, various chateaux and chapels. For our next LLC walk in November, we are doing TWO walks – one in the morning starting at 10.30 am which is an easy circular walk of about 5 kms and the other is a longer walk starting at 14.00 – a moderate circular walk of about 11.5 kms. Walkers are invited to do one or both if they are feeling fit enough! Bazian is an interesting medieval village situated on the D174 (just off the D34 Vic Fezensac/Montesquiou road. Both walks off fantastic panoramic views across the Valleys of the Guirou and l’Auzone. The shorter walk passes old ruins including ancient mills and gives a flavour for the longer walk. The longer walk passes through ancient forests, a peppered landscape with an abundance of ancient windmills and ruins with jaw-dropping panoramic views along the ridge before returning on the old ancient road back into Bazian village. The conical ancient mills had sails that could turn and change direction depending on the winds – like a tree – and were a sign of wealth for the area during that epoch. Our last walk for 2018 took place on Friday 28th December. It was a moderate circular walk of 11.5 kms (with a variant of 8 kms) starting at the small village of Caupenne d’Armagnac which is located about 5 kms from Nogaro. We walked past the church and the ancient ‘lavoir’ following a small lane. Heading up towards the tracks, we passed a very large ‘wetland’ nature reserve which wasn’t at all wet so unfortunately no migrating birds to see but it is possible to walk-around! This was fairly flat walking (unusual for the Gers!) and we did see distant views of the Nogaro aerodrome and racing circuit en route. We continued northerly towards Salles d’Armagnac and once we had crossed the Midou we did start to climb and then we made our way back to Caupenne. The first walk of 2019 took place on Friday 4th January and it was an easy, circular 8kms. 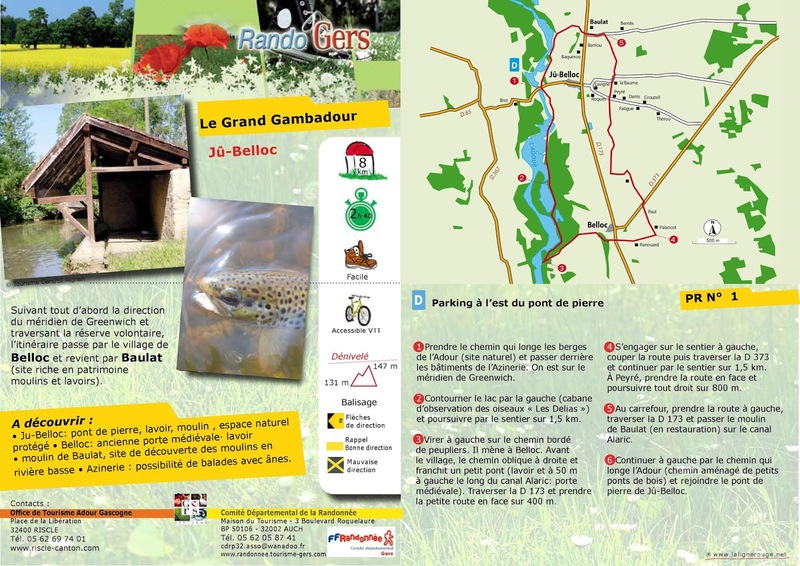 Sos is just over the border in the department of Lot and Garonne (between Gabarret and Poudenas). We met ouside the Post Office in the main square (which has greatly been improved over recent years). Sos is famed for its night food market in the summer where local producers gather on each Wednesday evening in July and August. We set off from the village centre passing the Marie and Cemetery on the way and cutting through to another small lane heading towards the Old Mill. We then continued along a track into ancient woodlands where we followed a dried up stream onto a stoney track leading out to the main road (D109 Reaup/Sos). We then continued on this road for about 300m before turning off towards the hamlet of St Martin and heading back into Sos. Lagraulet is a pretty hill-top village situated between Gondrin and Montreal-du-Gers. From either Gondrin or Montreal, take the D113 and turn-off at the St Lannes crossroads onto the D254. The longer walk is 12 kms; Variant (1) is about 8 kms and Variant (2) is about 10kms. The walk takes us into the Gers countryside with some outstanding views passing through two hamlets and by two mills and a lot of friendly horses! But, in order to get back into Lagraulet, there is a steep incline at the end! Variant (1) does NOT use this route back into the village and is therefore much easier. The longer walk should take us no more than 3.5 hours and is 70%/30% tracks/lanes. The sun did actually shine on us and the temperature was very convivial for walking. We ended up having our lunch in a ‘luxury’ hide complete with electricity and guttering!! We all enjoyed this walk including the dogs! For our next walk, we have a series of 3 circular walks very close to each other and the theme is ‘lakes and forest’. The dogs will love them and we will too! None are very long and most of the walks are on woodland trails. They will take place on Friday 8th March at 11.00 am at the Aignan lake for the start of the first walk. This walk takes us from the lake of Aignan through the pretty forest and out on a ridge where we have fantastic views of both Aignan and Sabazan. This is also a good place for our picnic lunch. There is a café but it may not be open out of season. Just up the road from Aignan off the D48 lies Gellenave. We follow a pretty forest trail below the church of St Go and up to the sweet chapel of Bouzonnet. 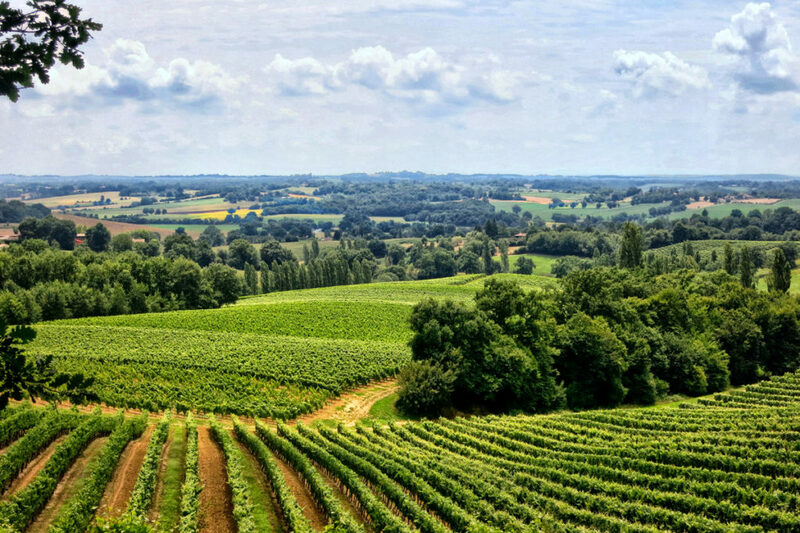 We then cut through the vineyards with more splendid views of Sabazan and the Aignan ridge where we have just left! Just up the road from Bouzon-Gellenave again on the D48 is Termes d’Armagnac. It is known for its medieval festival/enactments in July. From the medieval chateau/tower, we follow a track across fields into the woodlands and continue along another ridge with fabulous views before returning back to the village. These are 3 separate walks and we will have to drive between them but you do have a choice to do any or all of them. I would suggest that you bring something to eat if you are planning on all 3! and your name will be added to the mailing list for any future walks. Partners and dogs are welcomed into the Group and directions/maps will be emailed to you. We would be delighted to welcome you to our group.